Baby Play is crucial for a child's social, emotional, physical, and cognitive development. It is a child's way of learning about his body and the world. Play gyms, tummy time and mats represent a safe environment for such exploration. Baby Brands Direct, a dedicated nursery wholesaler, has stocked an exclusive range of play gyms, mats and tummy time mats, activity gyms with tummy time support, plush playmats and large playmats available to global retailers. Baby Brands Direct is delighted to have the distribution rights of award-winning brands including Fisher-Price, Tiny Love, Mothercare, Bright Starts, Baby Einstein and Lamaze to present you with the best range of gyms and platmats at wholesale prices. Discover a variety of themes and designs from rainforest to Peter Rabbit and playmats to activity gyms. Trust us to have on trend stock with functional quality goods that are preferred by parents. Gyms, Tummy Time and Playmats step in when parents need to rest and baby needs to be entertained. Of all the myriad potential purchases that a new parent can make, a good play mat or activity gym is among the most likely to earn its keep. A safe, comfortable and stimulating place where the infant is happy to lie, and later sit, is likely to prove invaluable. 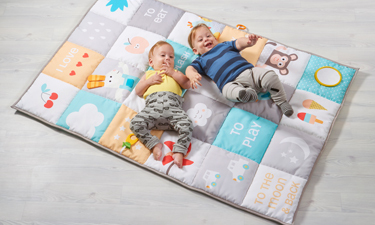 A recent growth in purchasing large playmats has been observed as tummy time can help babies develop strong head, neck and shoulder muscles and promote certain motor skills. Tummy time can also prevent the back of baby's head from becoming flat. Research also suggests that babies who spend time on their tummies crawl on their stomachs earlier than do babies who do not practice tummy time. With all this essential information is no wonder that sales keep rising. Browse the following pages to uncover more benefits of our baby products that will boost your trade too.